I am finally feeling human again. Despite the inconvenience, hailstorms are very cool! I got a chance to get out today! Today we had “weather.” The skies were blue and clear all day, with fluffy white clouds and it looked like if Olivia was able to get off work early, as she hoped to do, we might be able to get out and actually do something. I know Olivia has been disappointed that she’s had to work and we haven’t had the opportunity to do anything. All things considered, it’s probably for the best, given my cold (which is significantly better today). However, I was starting to wonder if I was ever going to get out of the complex. By 1:30, the skies started to darken. About this time, Olivia called to say that she thought she’d be home soon…and that it had just started to hail around her office. It was still all clear here. 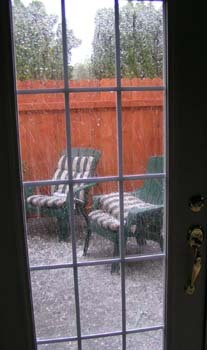 Within seconds the skies opened up and it began to hail heavily. Within a matter of minutes—less than 5, I think—there was an inch of hail in the low spots on the patio. Before the hail arrived, Olivia’s sister called. There are 7 kids in Olivia’ family—four boys and 3 girls. I haven’t met any of her brothers and had met her youngest sister, Carol when I was here a year ago, and again this time. But her middle sister, Maryann, arrived in town unexpectedly with her husband (in their RV). They were planning to park here in Boise overnight, so Olivia picked them up on her way home from work and brought them here. We packed all of us into Olivia’s little Lexus (none of us is exactly a “small” person!) 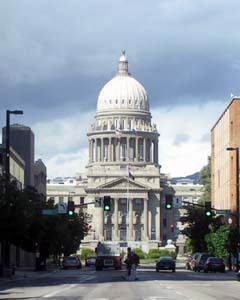 and headed into downtown Boise. The air was clear and freshly washed and I was able to get a nice photo of the capitol. We had dinner in a nice brewpub (great clam chowder!) and as we sat there eating, I could see it starting to pour again outside. By the time we finished dinner, it was sunny but there was a huge ominous looking black cloud off in the distance, moving in our direction. We took Maryann and her husband back to their RV and then headed back into town again to get Skippy from Doggie Day Care (I sincerely hope I’ll have photos of Doggie Day Care – which is really called The Hound Lounge – before I leave here!) 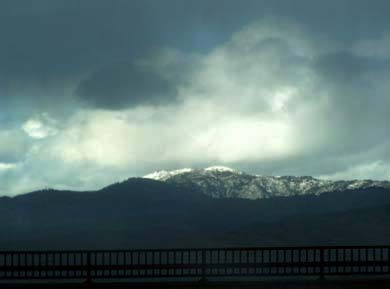 It poured rain all the way back into town but had cleared up again by the time we returned home. As I sit here typing, the sky is clear and blue and there are fluffy clouds and not a hint of rain. On the schedule for tonight is the homeowners’ meeting for which all of the gatherings of neighbors I’ve attended have been preparing. There are big issues to discuss and big guns to haul out and if there is no satisfaction forthcoming, lawsuits will be filed. I have been invited to come and watch the fun, but I told Olivia that much as I’d love to sit there for 2 hours and listen to arguments about CC&Rs for a condo development I’ve only visited twice, I was going to opt out and stay home to watch The West Wing. I don’t know what tomorrow will bring. It’s my last full day here and it will be interesting to see (a) how much time Olivia will have, and (b) what the weather will be like.